Are you a lipstick junkie? 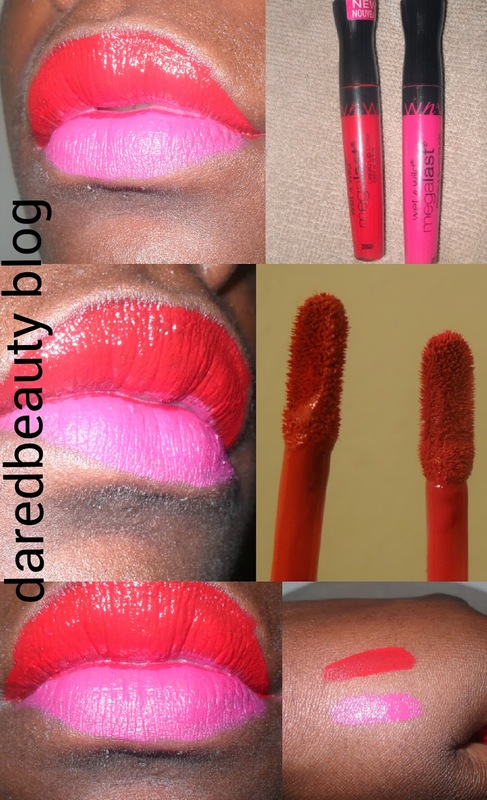 Love highly pigmented lippies that are very budget friendly. Welcome to the wonderful world of Mega Last Liquid Lip Color. This product comes in 13 fabulous shades that are truly worth it. With a smudge proof formula that comes in matte creme and shimmers, this product is truly to please. Applies like a lip gloss but dries to a lipstick (can life get any better!) It can, this product only retails for only $2.49/$3.99 (USD/CDN). Oh what a wonderful world this is. Tips: (This product is good without these steps, but follow these steps and you'll fall deeper in love with this product). Exfoliate your lips (get rid of the dead skin), then moisturize them with your favorite balm. When your pout is prepped, line lips with your favourite liner for a perfect pout. Then apply stain and VOILA! a perfect matte pout that will last all day (add gloss for a shiny look). Pros: Glides on smoothly (no choppy patches), highly pigmented, dries smoothly. It is a lip stain, therefore it isn't very moisturizing. This product does not transfer easily. Final Thoughts: This product is a fantastic buy. The product is truly great and for all lippy fanatics, like myself you should definitely try this product out. great review. i love the pink shade. thank you so much for the lovely comments.